uBabyCam enables simultaneous recording and remote access to live views and playback of recorded videos. 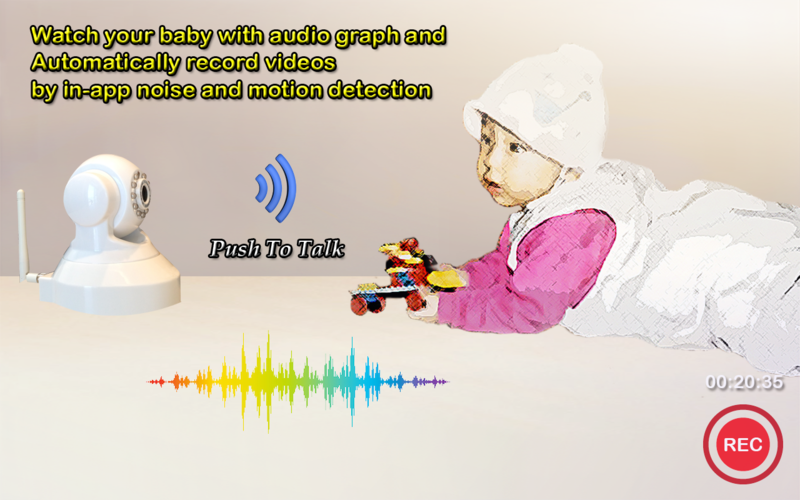 Not only can you monitor your baby’s movement with real time audio graph, but can also be alerted with audio and video recording when your baby needs the attention. Watch this screen shots to get a better understanding of what uBabyCam is all about. “uBabyCam works like a dream! Especially I love the ability to not only view multiple feeds simultaneously on a screen with 8 layout controls, also monitor my angels' movement with real time audio graph....."
Specially, the app not only stores the audio data for seven days, but shows a time-line graph of your baby’s sleep patterns up to 12 hours which can be sent to an email. This app does not attempt to explain the unusuality in your baby’s sleep pattern since corrected data is limited; it is only based on movement, just help parent to better understand your baby’s regular sleep habits.